2). 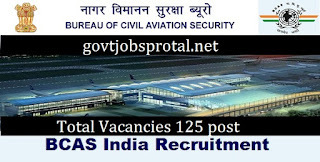 Name of Post :- Aviation Security Officere. b).With six year service in the grade rendered after appointment thereto on a regular basis in the level 5of pay matrix or equivalent in the cadre or department. 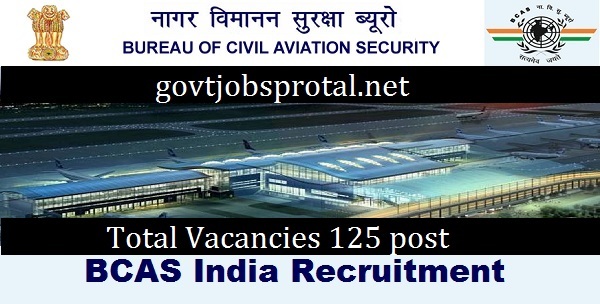 2).Three year experience in police/security/intelligence department of government of India or state government or union territories or public undertakings or autonomous Organization. 3). Period of deputation (ISTC) including period of deputation (ISTC) in another ex-cadre post held immediately post held immediately preceding this appointment in the same or some other organization or department of the central government shall ordinarily not to exceed three year. Candidates who apply for the post will not bellowed to withdraw to withdraw their candidatures subsequently. For futher details including Bio-data Proforma, Recruitment Rule etc candidates are requested to the website of this Bureau i.e. www.bcasindia.nic.in.